Growing up, my parents would plant a large garden in our yard, and during the summer we would partake in various fresh vegetables. But like all gardens, it always seemed like we had an abundance of zucchini. I remember being sent to our neighbors, zucchini in hand, sharing our harvest. 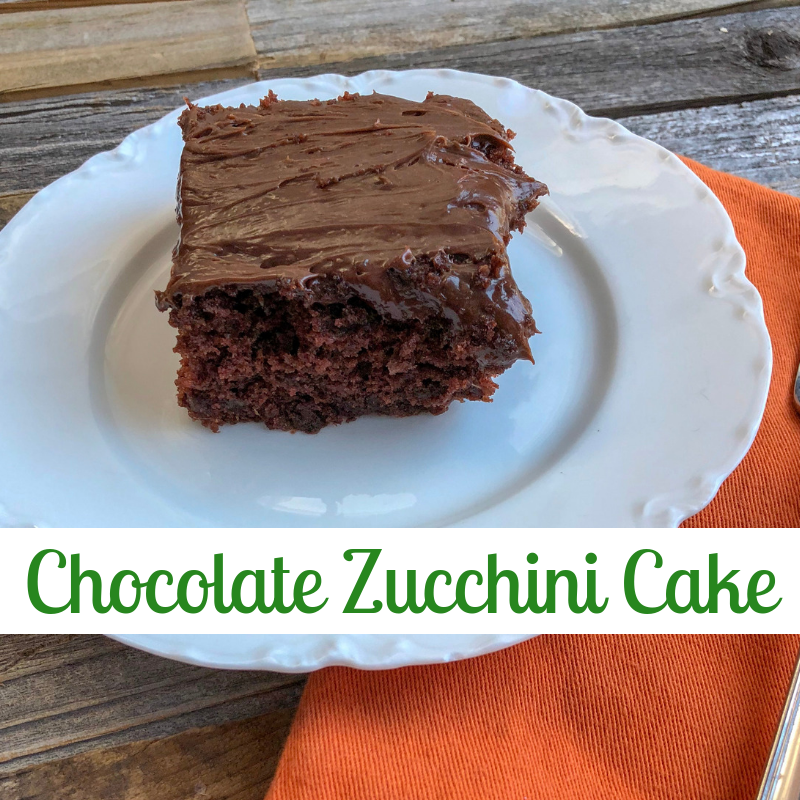 We used to eat a lot of squash for dinner, but my mom would also bake delectable desserts, including the one I want to share today: Chocolate Zucchini Cake. This is the easiest cake to make, and the pop of zucchini makes it so moist. Even my nephew, the pickiest eater I know, scarfs down pieces of this cake. And even though I put in four cups of grated zucchini, you can barely see it in the cake. This photo has the tiniest bit of zucchini present. The original recipe calls for topping with chocolate chips or nuts, or ice with chocolate icing. I top with canned chocolate icing, as my mom did. Tastes like my childhood summers! This is a moist cake, and oh so good. Cream butter, oil, and sugar. Add eggs, vanilla, and buttermilk. Continue beating. Sift dry ingredients together. Add to moist ingredients. Bake in a greased 9×13 pan, 325 degrees for 40-45 minutes.